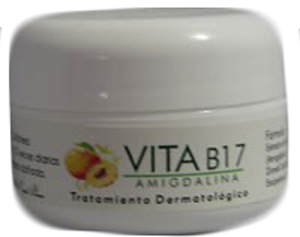 This vitamin B17 cream is a topical (used on the skin) cream that consists of pure laetrile (amygdalin). It is used for skin lesions or blemishes caused by excessive sun and/or skin conditions. One of the ingredients is DMSO which carries the laetrile through the surface of the skin.